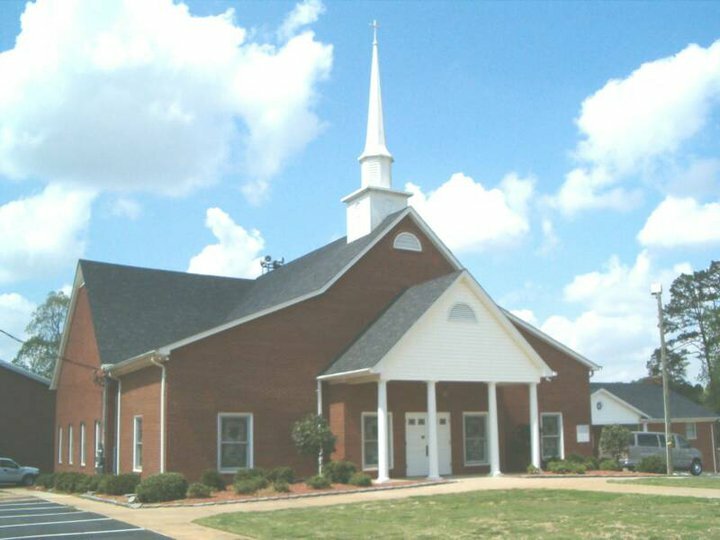 Clear Creek Baptist Church had its beginnings under a big oak tree alongside the "Great Road", which is now Ferguson Road. Rev. E.C. Williams held revival meetings under the brush arbors before the Church was organized. The need for a more permanent place of worship led to the organization of Clear Creek Baptist Church on land belonging to the Lewis B. Ferguson Family. In April, 1858 the church was organized, with Rev. EC Williams being elected as its first pastor in August 1858. On November 21, 1864 Pleasant Calloway Ferguson transferred to Clear Creek Baptist Church, a two-acre parcel of land for the sum of $10.00, which today is the church cemetery. In 1875 a mission project was started in the Arlington Community, which later was organized as a separate church in the fall of 1880. This church still stands today, known as Arlington Baptist Church. In 1893 Jane Ferguson transferred a three-acre tract of land to CCBC, for a sum of $30.00. In 1947 the church was moved across the road to its current location. Otis D. Watts and Vertie Ferguson Watts transferred a parcel of land in July, 1953, for the sum of one dollar, which later became the site for the church Parsonage. The Parsonage was sold in 1997, but was reacquired in 2006, and is currently the home of our Pastor and his wife. In 1965 Beulah Harkey transferred to CCBC a two-acre tract of land for a sum of $1400. 00, which became the church ball field. In 1967 the Church completed the Educational Building for more Sunday school space, nursery rooms and a fellowship hall. On July 6, 2006, a ground breaking ceremony was held for the Family Life Center. The Family Life Center was completed in 2007 and dedicated on June 3, 2007. Clear Creek Baptist Church is the second oldest church in Mecklenburg County. The history of Clear Creek Baptist Church continues to be written by individuals who are serving the Lord, just as their parents and grandparents did before them. We are grateful to our Heavenly Father for the many dedicated Christians who have joined our church family in recent years. Rev. Homer Murdock and the church family look forward to sharing the Word of God, prayer, worship and service together, with our community. With our great heritage, experience and warm friendship we look forward to many wonderful years of service for our Lord Jesus Christ.